The dish was made famous at Delmonico's Restaurant in New York in 1876 when the recipe was brought to chef Charles Ranhofer by a West Indies sea captain named Ben Wenberg. It was an immediate hit, especially for after-theater suppers, and owner Charles Delmonico honored the capatain by naming the dish "lobster a la Wenberg." But later Wenberg and Delmonico had a falling-out, and the restauranteur took the dish off the menu, restoring it only by popular demand by renaming it "lobster a la Newberg," reversing the first three letters of the captain's name. Into a large kettle of boiling salted water plunge the lobsters, head first, and boil them, covered, for 8 minutes from the time the water returns to a boil. Transfer the lobsters with tongs to a cutting board and let them cool until they can be handled. Break off the claws at the body and crack them. Remove the claw meat and cut it into 1/2-inch pieces. Halve the lobsters length-wise along the undersides, remove the meat from the tails, discarding the bodies, and cut it into 1/2-inch pieces. In a heavy saucepan cook the lobster meat in the butter over moderate heat, stirring occasionally, for 2 minutes, add 2 tablespoons of the Sherry and 3 tablespoons of the brandy, and cook the mixture, stirring, for 2 minutes. Transfer the lobster meat with a slotted spoon to a bowl. Add the cream to the Sherry mixture and boil the mixture until it is reduced to about 1 cup. Reduce the heat to low and stir in the remaining 1 teaspoon Sherry, the remaining 1 teaspoon brandy, the nutmeg, the cayenne, and salt to taste. Whisk in the yolks, cook the mixture, whisking constantly, until it registers 140°F. on a deep-fat thermometer, and cook it, whisking, for 3 minutes more. 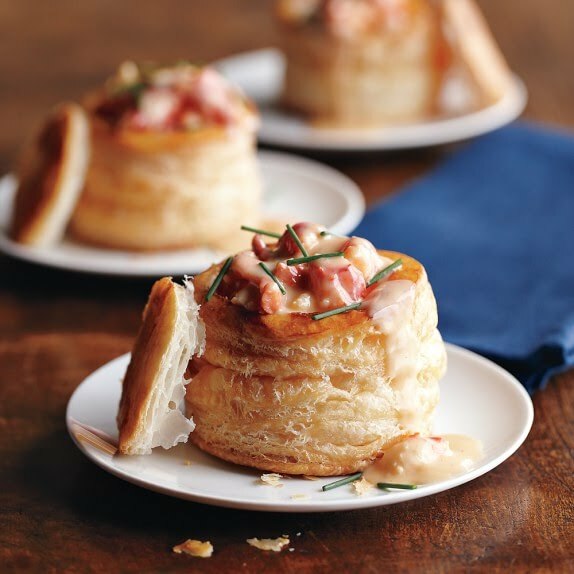 Stir in the lobster meat and serve the lobster Newburg in a pastry shell.